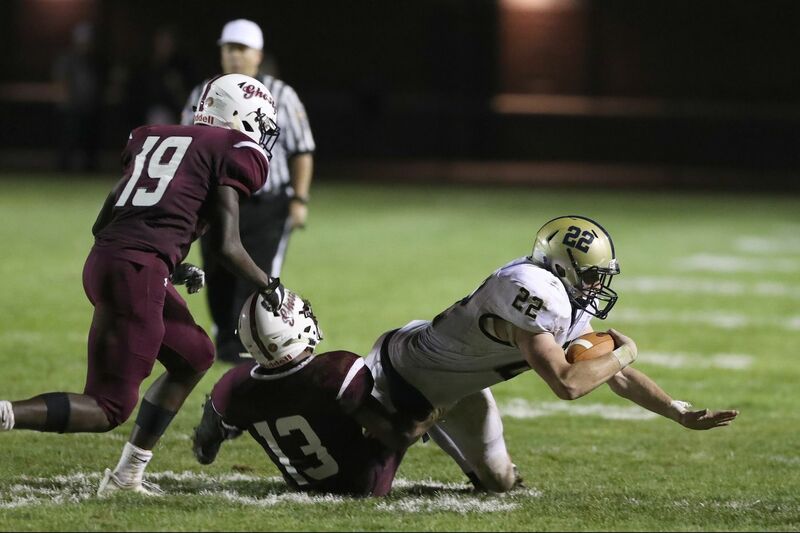 Council Rock Souths Chase Patterson (22) picks up yardage before being tackled by Abington’s Jordan Grimaldi (13). Workhorse running back Chase Patterson placed much of the blame for Council Rock's South's lackluster first-half showing against Abington on himself. "The offensive line was blocking well, but I wasn't finding the holes," he said. "I got off to a bad start. I had to make up for in the second half." Patterson did exactly that, carrying defenders on his back for key yardage and scoring a pair of touchdowns as the visiting Golden Hawks rallied to beat the Galloping Ghosts, 14-10, Friday night at Stephen A. Schwarzman Stadium. "He's a stud," C.R. South coach Vince Bedesem said matter-of-factly. "He takes the hits, keeps moving his legs, and moves the chains." In posting their fourth straight victory following a 17-0 loss at Cheltenham, Patterson and Co. improved to 4-1 overall and 2-0 in the Suburban One League National Conference. Dawson Fresses (4) of Council Rock South is hugged by Brandon Berghaier after Dawson’s long run set up the go-ahead touchdown. Patterson carried 27 times for 94 yards and second-half scores of 1 and 2 yards as the Golden Hawks overcame a 10-0 deficit against Abington (3-2, 1-1). Bedesem said the 6-foot, 195-pound senior played despite suffering a separated shoulder in last week's 20-6 conference win over previously undefeated Harry S Truman. The Ghosts broke a scoreless tie late in the first half on Reese Gibbs' 40-yard field goal and, after recovering a fumble on the ensuing squib kickoff, made it 10-0 on quarterback Tamir Berthau's 8-yard run. C.R. South managed only 96 yards of offense (32 rushing, 64 passing) in the first half; coughed up the ball twice; and wiped out a scoring opportunity on a pass-interference call. Patterson, who doubles as a part-time outside linebacker, carried eight times for 32 yards before the break. "I told myself at halftime, 'I really need to pick it up,' " Patterson said. "I think my teammates took the same approach." Patterson's two older brothers also played for Bedesem and C.R. South. Mark, 24, was an offensive lineman; Brendan, 20, was a fullback. "I learned a lot from the two of them," Chase said. Noah Caldani of Council Rock South is brought down by Oreck Frazier (19) and Jordan Grimaldi of Abington. The Golden Hawks' defense was spearheaded by ends Nick Gallo and T.J. Prince, tackles, Shamir Parker and Shemar Mills, linebackers Bradley Kraut, Eric Woloshyn and Sammy Vaniver, and safety Matt Checchia. Patterson, of Richboro, is also a standout midfielder in lacrosse. The 18-year-old will play that sport at Hofstra.